Every day we receive a lot of questions about US expat taxes for US citizens living in Australia. No wonder there is a big demand as there are over 200,000 US expats living down there. For a few years, Australia tops ratings as one of the best expat destinations. It’s the English-speaking country with high-quality living conditions, warm weather, and beautiful beaches. And it’s expat friendly! Do you know that 1/5 of the Australian population was born outside the country? Do you want to have a free 20 min phone consultancy call with US tax expert? Contact us now. Besides filing US tax returns while living in Australia, many Americans abroad also have to submit an FBAR. It stands for Foreign Bank Account Reporting and it’s reported on FinCEN Form 114. The regular due date is April 15th, 2018. However, there is an automatic deadline extension to October 15th, 2018. Being required to file an annual US tax return doesn’t necessarily mean you have to pay it! In fact, many of Americans abroad don’t owe any taxes! There are few provisions which prevent double taxation as well as help US expats to save money on their tax bills. Most popular option among self-filing US expats is the Foreign Earned Income Exclusion. It allows excluding USD 104,100 (this amount is for 2018 taxes) of foreign earned income. Please note that most of the US international tax accountants recommend using a Foreign Tax Credit instead. It has a few advantages over FEIE. The main difference between these two is Foreign Tax Credit allows to reduce the tax on remaining income based on the taxes paid to the foreign government. The Australian version of the IRS is The Australia Tax Office and it’s a primary tax collection agency there. Tax Tip 1: You need to have a Tax File Number (TFN) to file Australian taxes. It’s equivalent to the Social Security Number in the US. It’s a unique number and assigned for life. If you don’t have such number, then you will have to pay taxes on both wage and investment income. You can obtain TFN even as a temporary resident. Speaking about Australian Tax rates it’s worth mentioning that the tax system is both graduated and progressive. However, the tax tables are different for residents and non-residents. Lived in Australia for at least 6 continuous months, had a single job and a single place. Still unsure if you are a tax resident? Check out the official website of the Australian Taxation Office here to determine if you are a resident for tax purposes. The following are the rates for the 2017-2018 financial year. Source: the Australian Taxation Office. In addition, there is a 2% Medicare levy. Superannuation is an Australian version of 401(k) program, but mandatory and in a bigger scale. Employers must contribute 9,5% of employee’s base wages if they earn over AUD 450 in a month. However, employee contributions are voluntary. Contributions by employees are deductible on Australian taxes, but not on US taxes. Also, access to superannuation funds is restricted to those who are of retirement age unless they are one of a number of special circumstances. There is a US tax treaty with Australia, which is in place to avoid double taxation. 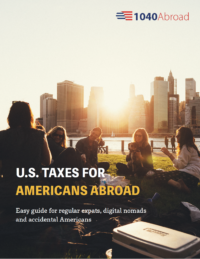 If you want to know more about the rules of US expat taxes for US citizens living in Australia, you can read the document here. Most of the treaty is about property and commerce. It also has certain provisions and established the right of the respective governments to impose taxes on certain types of income depending on where the income was earned. You can find most of the rules regarding double taxations in this tax treaty. It’s Article 22 which covers the topic of the Australia – US Double Tax agreement. For example, this tax treaty excludes the pension, social security, and annuity income which a resident receives in their home country. What does it mean? Well, for example, let’s imagine you are a US citizen living in Australia and considered to be a resident there. You receive income from your Australian pension and you will exclude it from your US expat taxes. There are other cases when the saving clause за the tax treaty overrides Article 22. That can lead to requiring you to pay taxes on your income from Australian pension. If you are a non-resident, then you don’t have to report foreign earnings. Temporary residents might need to report this kind of income but it doesn’t include investment or passive income earnings. Lastly, Australia residents have to reports global income and there are some methods available to avoid double taxation. What about US expat taxes for self-employed US citizens living in Australia? If you are a self-employed US citizen living in Australia, then your tax situation is a bit different. Companies in Australia have corporate taxes at flat 27,5% rate for entities with a turnover of less than $25 million. And these company taxes must be pre-paid quarterly based on what is anticipated to be owed. It’s important to know that your corporation can be considered as an Australian entity even if it’s not incorporated there. It’s enough to carry out the business in Australia and have Australian ownership or control. Just as in the US, different business structures have different tax responsibilities and obligations. They as well can be structured as sole traders, companies, partnerships or trusts. Last, but not least is Australian GST. The GST stands for Good and Services Tax and it’s a value-added tax that applies to most goods& services transactions, excluding certain items. The GST has a flat rate of 10%. If you are a business owner with over $75,00 of receipts, you need to register with the government and collect GST. Tourists are eligible to receive a refund of the GST they paid during the prior 2 months. They will need to present items and receipts when leaving the country. Do you need a help with filing US expat taxes from Australia? Contact us now to receive a free 20-min phone consultancy! We have helped over hundreds of Americans in Australia to file their US taxes and catch up with the late filing without any penalties.